(Bloomberg) -- Beto O’Rourke’s highly public journey to the 2020 presidential race landed him in Iowa with a big splash on Thursday. Now, Democrats are waiting on him once again - this time to see if he can deliver on the hype. His campaign kick-off fit the image cultivated during O’Rourke’s unsuccessful, U.S. Senate bid. Presaged by a glossy Vanity Fair cover, Day One opened with a video announcement, continued with a televised appearance before cheering supporters at a coffee shop and ended with a marathon sprint across the state. Also true to the former Texas congressman’s style, the roll-out had a loose, impromptu feel that raised questions about whether he’s fully ready for a national campaign. The announcement’s timing shifted abruptly in the middle of the night, and the candidate himself spoiled any surprise by texting the news to a hometown TV station. His entire schedule wasn’t made public and there was scant evidence of staff support at events. His answers to questions were heavier on biography than policy. Speculation about whether the former three-term U.S. representative from El Paso would make a bid for the 2020 Democratic nomination began almost as soon as his loss to Republican Senator Ted Cruz was declared last November. He begins it facing high expectations as well as plenty of doubts. 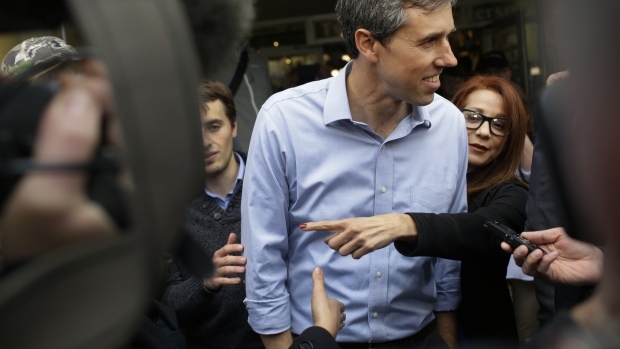 O’Rourke will have to establish whether he can replicate the impressive fundraising of his Senate campaign, offer substantive answers to policy questions and break out of the pack of candidates not named Joe Biden or Bernie Sanders. So far, polling isn’t especially promising. He received support from 5 percent in an Iowa Poll of likely Democratic caucus participants released last week, down from 11 percent in December. More than a third of likely caucus-goers -- 36 percent -- didn’t know enough about him to form an opinion. That matches national polls and puts him in the middle of a cluster of candidates that includes Senators Elizabeth Warren of Massachusetts, Kamala Harris of California, Cory Booker of New Jersey and Amy Klobuchar of Minnesota. Biden, the former vice president who hasn’t announced a campaign yet, and Sanders, the senator from Vermont who’s officially in the race, have substantial leads in the Iowa Poll and national surveys. The nine other declared candidates barely register. Before Thursday, top Democratic operatives in Iowa had begun to privately express exasperation with the Texan’s drawn-out musing about whether to run and his late entry. Some campaign workers have been waiting to decide whether they should work for other candidates before the full field has formed, including some waiting for decisions from O’Rourke and Biden. The attention given to O’Rourke also has been a source of frustration among supporters of the record number of female candidates in the Democratic field. His post-Senate race road trip and comments about relying on his wife to take care of their three children rubbed some feminists the wrong way. "Serious question: 44 of our presidents have been white men. Two white men are at the top of all Democratic primary polls and three of them get much of the press around the primary, even before getting in. Why is it being framed as a challenge to get over in this primary?" Christina Reynolds, the vice president of communications at Emily’s List, wrote in a Thursday morning tweet. She added that she wasn’t criticizing any candidates and added, "Don’t we all want those candidates judged on a level playing field?" But O’Rourke’s ability to portray authenticity are his big selling points to many Democrats. Among them is Valerie Ward, 50, who drove about 90 minutes from her home in Iowa City to see O’Rourke in Burlington. Republicans see O’Rourke as one of the bigger potential threats to President Donald Trump among the Democratic field. When asked about O’Rourke’s entry to the race, Trump used the kind of belittling rhetoric he’s directed at other prominent candidates. “I think he has a lot of hand movement. I’ve never seen anything like it," Trump, no stranger to dramatic hand gestures, told reporters in the Oval Office on Thursday. "Is he crazy or is that just the way he acts?" O’Rourke is sometimes compared to former President Barack Obama for his quick rise to prominence at a relatively young age and ability to provoke a passionate following. But his way of operating on the campaign trail has more in common with Trump. Both rely on gut instinct more than carefully focus-grouped ideas. Their campaigns have eschewed conventions of major political operations in favor of a more improvisational style. That includes last-minute changes to schedules and the occasional use of vulgarity on the stump. As Trump’s team has learned as it plots out his re-election campaign, O’Rourke’s national campaign will require a more conventional organization. "Anytime in which you take any type of enterprises bigger, there does need to be some tighter structure and organization," said Matt Angle, a Democratic political strategist in Texas and founder of the Lone Star Project. "It will be a challenge for the people who end up being staffers to make sure the trains run on time and also to make sure their candidate is presented in a genuine way to the public." The “tricky” part for O’Rourke’s campaign, Angle said, is that he shouldn’t “do anything that takes away from a genuine reflection of his personality, his energy, his spontaneity." After distancing himself from pollsters and consultants during his Senate race and falling short of a win, O’Rourke said in an interview with the El Paso Times published Thursday that he would turn to outside advice but not rely on it. --With assistance from Billy House.